← The 55th Annual Grammy Awards – What A Concert! 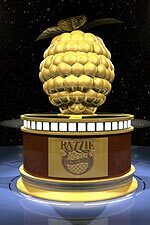 Everyone may dream of winning an Oscar, but no-one dreams of winning a Razzie. That doesn’t stop them being awarded though. Last night The Razzies for the worst of the worst film work of 2012 were awarded. The big ‘winner’ was Breaking Dawn Part 2 (7 awards, including worst film, Kristen Stewart for worst actress and Taylor Lautner and Mackenzie Foy for worst on screen couple). Also recognised last night was Adam Sandler, won his second Worst Actor Razzie in a row for his role in That’s My Boy, and Rihanna won her first film award – worst supporting actress, for her role in Battleship. Unfortunately, none of the winners took a leaf out of Sandra Bullock’s book and turned up to accept their award. This entry was posted in Movie News and tagged 2013 Razzies, Adam Sandler, Breaking Dawn Part 2, Kristen Stewart, Rihanna, Sarina Bellissimo, Taylor Lautner, The Bellissimo Files, Twilight. Bookmark the permalink.